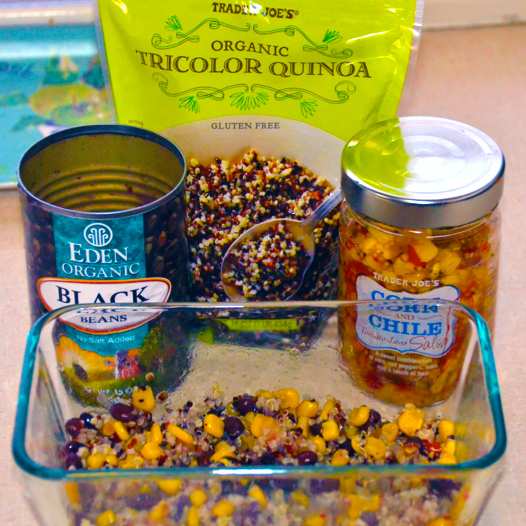 Home » Recipes » Gluten Free » Quick and Easy Lunch – Quinoa, Black Bean and Corn Salsa. My daughter loves trying samples. We were recently at Trader Joe’s and she tried a cold quinoa and corn salad. I asked her, “if I buy it will you take time to eat it at lunch?” “Of course,” she said. Like most elementary school kids, when she’s at school she’s more interested in playing or some days doesn’t have enough time to eat. She requested I add black beans. Don’t forget to have the kids measure and mix! 1 glass jar of Trader Joe’s Corn and Chile Tomato-Less Salsa. Cook quinoa according to package instructions. Be sure to rinse. I use two colanders stacked together on top of a bowl. Quinoa is very tiny and can fall through the cracks. But rinsing it eliminates bitter residue. I cook mine in our 20 year old rice cooker with 1 1/2 cups of quinoa to 3 cups of water or veggie broth. Once done, add in 1 can of rinsed black beans and 1 jar of Trader’s Joe’s Corn and Chile Tomato-Less Salsa. Mix together, eat and enjoy. I packed two little containers for the next 2 days of camp lunch, she’s been eating it! « Bruschetta Recipe -So Delicious! Comment on Quick and Easy Lunch – Quinoa, Black Bean and Corn Salsa. Always looking for quick and healthy meals for my kid, thanks, for sharing this.